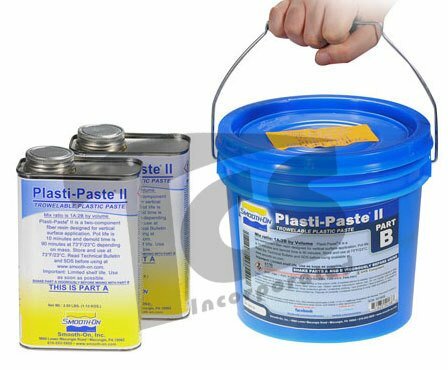 New Plasti-Paste® II is a two component fiber-filled resin that is designed for vertical surface application. This no-odor formulation is an improved version of our original Plasti-Paste® formula, andthe cured product is different in the following ways: 1. 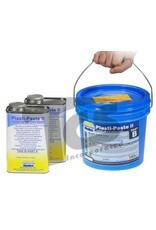 Cured plastic can be painted (original Plasti Paste® can not) and 2. It is harder, more rigid with better heat resistance. Part A is a liquid and Part B is a paste. New Mix Ratio is 1A: 2B by volume (62A:100B by weight). Pot life is 10 minutes at room temperature depending on mass. Demold time (can be handled) is about 90 minutes at room temperature depending on mass. Full cure; 24 hours at room temperature. Cure time can be accelerated by applying heat. Mixed material holds a vertical surface without sagging and cures to a strong, durable and lightweight plastic. Liquid material can be pigmented with So-Strong® color tints from Smooth-On. This plastic can be used for creating themed environments or special effects, used as a "mother mold" material to reinforce rubber molds and a variety of other applications. This plastic is also a powerful adhesive and can be used as a repair material for a variety of industrial applications. Cured plastic can be sanded, machined and painted with acrylic enamel paints.